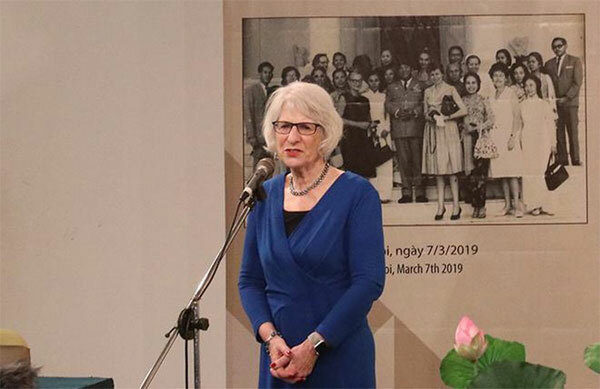 VietNamNet Bridge – American lawyer Nancy Hollander recently handed 450 documents, photographs and other memorabilia concerning the first meeting between the Vietnamese Women’s Union and the US Women Strike for Peace Organisation in Jakarta in 1965, to the Vietnamese Women’s Museum. Hollander is the only surviving American to have attended the meeting. Van Huong spoke with her at the hand-over ceremony. How did you come to attend the historic meeting between American and Vietnamese women in Jakarta in 1965? In 1965, I was a college student. Someone from the Women Strike for Peace Organisation asked me if I wanted to join the first delegation of American women to meet with Vietnamese women to show diplomacy between Americans, who were trying to end the war, and Vietnamese women, who also wanted an end to conflict. That’s how the meeting began. How did you collect the materials? Most of the materials I got at the meeting and I took notes every day. We met for about ten days. But then some came later to me in letters from Vietnamese women. We wrote back and forth to each other for several years. When I met the Vietnamese women, I was happy. We had a lot of time to talk. We learned that we were the same. We saw women who had families, who cared about having a safe and peaceful world. And yet we had a lot of strength in being together. I had communications with many of the women for many years after that. At that time, I was very active against the war in Vietnam. We had marches in Washington. I spoke at many schools and colleges. Particularly after this meeting, I had more information so I went around speaking and worked actively against the war until the day it ended. Why did you decide to give the memorabilia to the Museum of Vietnamese Women? I had these documents for 50 years. I kept them all in a box. Whenever I moved, the box moved with me. And I always wanted them to come back to Vietnam, not to stay in the US. Only recently was I able to find Lady Borton, who helped me bring them here. I was very happy that they finally came here. What is the significance of these materials to Vietnam? This was the very first meeting of American and Vietnamese women organised by the Vietnamese Women’s Union and the Women Strike for Peace and it was a meeting of peace, a chance for the American women to learn what was happening in Vietnam, of casualties, women and children being killed, and to go back to the US to tell other people why they should be striking against the war. That was why we went to learn first hand how devastating the war was in Vietnam. I think these documents are extremely important. Most people don’t remember this time in history. This is a very young country. Many people here were not alive during the war. And it’s important to see what diplomacy can do. And I believed then, and I believe now that the students’ movements in the US contributed to the end of that war. I think the war would have gone on longer without the work we did. And I think that the work that the Vietnamese women did of being willing to meet with the American women even though our countries were at war was very significant. People now need to see how people working together, women working together can bring peace in a very difficult time. Which object is most important to you? One day we all exchanged clothes. I had some photographs of us wearing each other’s clothes. So, somewhere my dress might still be in Vietnam. And I kept the áo dài [Vietnamese traditional long dress] that I was given. It was just a way that we were communicating with each other and showing our friendship. But there are other items. Like the scarf that young people wore in Vietnam when they were demonstrating. It was similar to what American women were doing. And I also have a ring that was made from an [American] aircraft that was shot down in the north [of Vietnam] plus all the letters and the notes. I think it’s all very significant and I hope people will take time to learn from it. That’s why we have museums, so we can learn from history. The scarf was particularly important to me and the information that I learned in the journal was most important. Because that’s how I was able to go back and talk to other Americans and explain what was really happening because you understand that we were not told in the US what was really happening in Vietnam. What do you think about the war as a woman? I think that if women were running the world, we will have a more peaceful world. I think that women are very strong and determined to bring peace to the entire planet that we see other women as our friends, no matter where they live and women are very good peace makers. 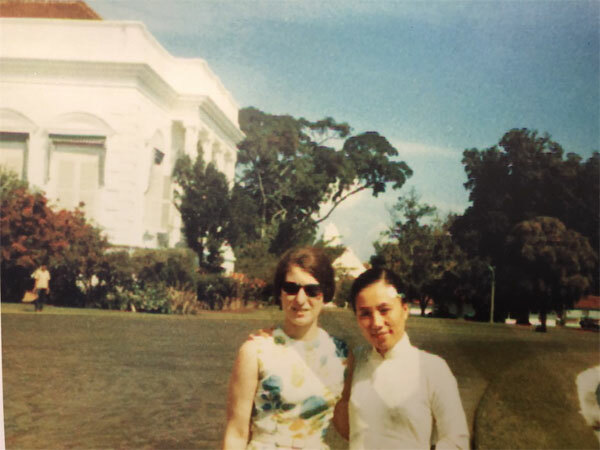 Special snap: A photo of Nancy Hollander (left) and Madam Nguyen Thi Binh in Jakarta in 1965, which is among objects that Hollander gave back to the Vietnamese Women’s Museum on March 7. For the last 40 years, I have been a lawyer and I represent people who are accused of crimes in the US and internationally. What do you think about the current relationship between Vietnam and the US? My understanding is that Vietnam and the US have a very good relationship. I was here about 20 years ago and the relations were good then and now they’re even better. I think Vietnam has shown that it is a very strong country built by very strong people, men and women. They must be very proud of Vietnam’s place in the world today. When we met in Indonesia in 1965, we had no idea how long the war would go on. But we all said that we would meet again when the war ended. I was not able to do that until 1998, when I met Madam Nguyen Thi Binh again. She was the Vice President at that time. Most of the women have passed away. I was much younger than any other women in the American delegation. 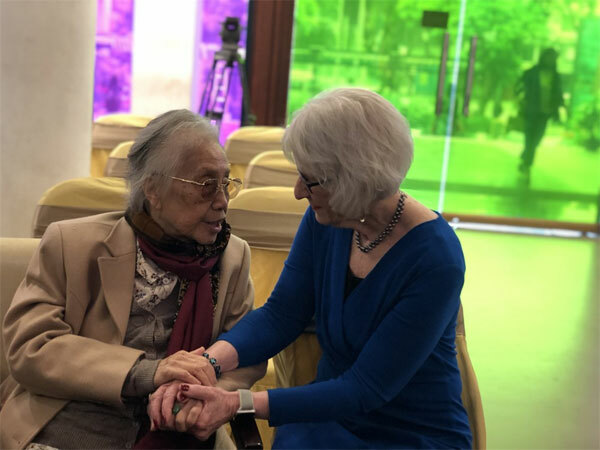 I am the only one alive on the American side and I believe that on Vietnamese side, Madam Binh is the only one still living. So she and I are the only two who can still meet. How do you feel about meeting Madam Nguyen Thi Binh again today? I’m very excited to see her again. I haven’t seen her for 20 years and we first met over 50 years ago. That’s a very long friendship and I am really excited that I have the opportunity to see her again.